Stir-fry is easy to make once you learn the basics. 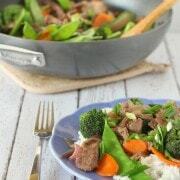 Start with this easy Beef and Vegetable stir-fry recipe and you’ll gain confidence quickly. Making stir-fry is something I think every cook should know how to do. Why? Easy — If you know the basics, making stir-fry is a quick and easy meal. Healthy — Lean protein + tons of veggies + rice = balanced and healthy meal. Choose brown rice if you can resist the sweet fragrance of jasmine rice. I can’t. Versatile — you can use up any veggies in your fridge with any kind of meat you have on hand. 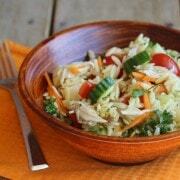 Once you know the basic formula, it is so easy to throw together a quick stir-fry. Ready for it? Protein + Vegetables + Sauce + Crunch (optional) + Something to serve it over = Stir-fry recipe for success! Beef — use a lean cut such as flank steak. Cut against the grain. Sauce. This is where a little knowledge comes in. Or you can just google for a great recipe! This recipe has a very simple sauce with beef broth, soy sauce and red pepper flakes. A little cornstarch is key to help things thicken up so that the sauce really coats everything. You could also buy your favorite premade sauce from the store if you are a beginner or in a hurry. If you like sweet and sour sauce you can easily get that at the store. 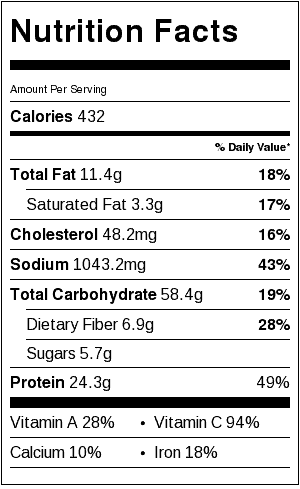 I prefer homemade mostly because we watch our sodium intake closely. Other great flavors to throw in either in the sauce or with the vegetables are grated ginger or minced garlic. Easy as pie. Errr…easy as stir-fry? ‘Cause pie is hard to make. Easy to eat though. Have your pan super hot! Make sure everything is cut up and prepped and ready to go before you turn your pan on. Stir-fry moves quickly so you’ll want to have everything ready to go. That includes your sauce. Like I said — this is a simple recipe that could easily be customized based on what is in your fridge or what you prefer to eat in your stir-fry. I used beef, broccoli, carrots, red onions and the simple sauce that I mentioned earlier. I served it up with jasmine rice (I could live on that stuff) and topped it with some sliced green onions to add freshness. Anolon sent me something off my wish list — a stir fry pan from their Nouvelle Copper line — and it made this recipe a breeze. Any deep, large skillet/frying pan will work for stir-fry but if it has high sides like this one or this one from Anolon, it’s sure to be a lot less messy. Now I just need to make room for the pan in my overflowing kitchen. One of my old pans is going to have to find a new home so I can find a place for my new Anolon stir-fry pan…. In a small bowl combine cornstarch, sugar and red pepper flakes. Whisk in beef broth and soy sauce and set aside. Sprinkle sliced beef with salt and pepper (go light on salt because the sauce will add a lot). Heat oil in a wok over high heat. Tilt pan and swirl to coat the sides. Add the onions and carrots and stir-fry for 2 minutes. Add the steak and broccoli and stir-fry for two more minutes. Stir in brown mixture and snow peas and cook for another 1-2 minutes or until meat and peas are cooked to desired doneness. Serve over rice and garnish with sliced green onions. Verdict: Loved this recipe. We will be having this again for sure. Husband’s take: Ben and the kids all loved this meal. Changes I would make: None are necessary but the beauty of stir-fry is that it can be different every time! Difficulty: Follow the tips above and you’ll be fine! Follow the links below to find out what everyone else made in their shiny new Anolon pans! Disclaimer: Anolon sent me a pan to try out and use for the creation of this recipe. I was not compensated to write this post. Post contains an affiliate link to a cookbook on Amazon. Thanks for supporting Rachel Cooks. I’d make a big pot of soup. 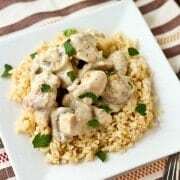 I would make chicken and mushrooms in a creamy wine sauce. Yum! I would love to make stir fry and different types of soups. I have a great recipe for cashew chicken, it would be such a cinch in an Anolon pan! I love Anolon Cookware! I have 2 sets. I love Stir Fry foods! I am hoping to replace my stir fry pan I lost in our 2011 flood. Just haven’t gotten that far yet. 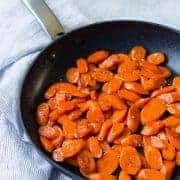 I would make fried taters and spam, sounds great to me, this is a neat pan and thanks for sharing your recipe, I wish my hubby likes stir fry..
Looks like a fabulous and easy dinner! I would like to make fajitas. I would make some nice hot soup! Nothing like some soup on a snowy winter day. I would like to make all kids of yummy recipe with my new set of Anolon Cookware, of I won! Stir fry. steam fish, beef stew, pan seared steaks, wonderful sauces to go with that, fruit preserves, etc. Soup, sauces, pasta, scrambled eggs… you name it! I will have my first dinner party and cook all my favorite Cajun dishes : jambalaya, chicken fricassée, etc. I’d probably make stir fry – this looks great! Carrot sausage risotto. No doubt! I make a chicken & vegetable teriyaki stir fry with brown rice a couple of times a month. If there are any leftovers, they make a great fried rice the next day. An easy, but full of flavor, weeknight meal! Love stir fry! Thanks, Rachel! I would make stir-fry or some kind of pasta dish! I would make some chicken marsala. I would make chicken and andouille sausage gumbo and jambalaya! I’d like to make a big dinner for my family: Spaghetti, meatballs, garlic bread, salad, and tiramisu for dessert. Stir fry all day, every day. Love this!! I would make stirfry, fried rice, tempura, seafood scampi, all kinds of things! With all these pans I could cook more than a one pot dinner. I would make shrimp vegetable stir fry. Yummie!! Um, totally loving this recipe! Definitely adding it to the weekly menu rotation!! Mmm I love a good stir fry, it always seems to hit the spot. Great recipe! I would make pasta, soups, saute chicken, veggies etc. I would stir-fry, pan sear, sauce and everything in between. Looking to eating healthier this year. This cookware could be the ticket! This stir-fry is so healthy looking! All those veggies make my mouth water! I would use your stirfry recipe but subsitute chicken for the beef! I would be making lots of yummy vegan food! This time of year, that means soups, stews and curries. One of my favorite soups is Ribolita. Plus I could give my old-school Calphalon to my daughter. She needs a good set of cookware. I am loving this recipe. 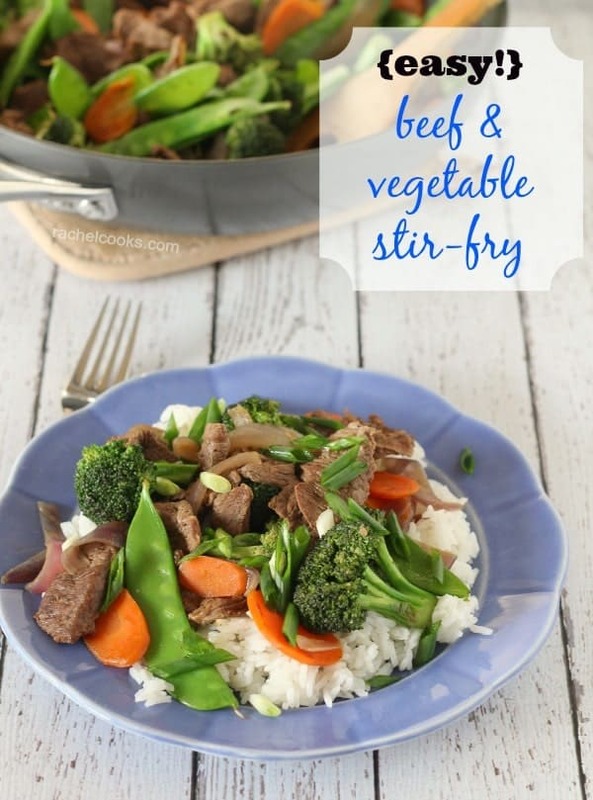 Stir fry is my go to dinner… one of the few ways I can get veggies AND protein into my kiddos. I would use the new set of Anolon Cookware to make a variety of dishes for my family. I have not tried to make stir fry before but it sounds delicious. I’m excited to try this stir-fry! I have a whole list of recipes waiting for me to cook! I would love to have awhole new pot and pan set to do it in! Stirfry for us as well, but the real test is how it does with eggs…. I would make some homemade pasta with homemade sauce :) my family is a big fan of any type of stir fry or pasta. I love making stir fries! I can make it different each time! I can adapt it to suit anyone’s taste! Fantastic recipe! I would make Eggs Benedict for my hubby and me and make pancakes for the kiddos. I think I would make a chicken stir-fry for my hubby. I would first make a chicken stir fry. Then I would make a sausage stir fry, which I used to make all the time and haven’t had for a very long time. Oh – awesome- I would start with a simple stir-fry & then everything else under the sun. I love that we both made stir-fries! Love your tips! I would make Pasta Risotto and Chicken Cutlets with lemon and basil ! This stir fry looks very good. 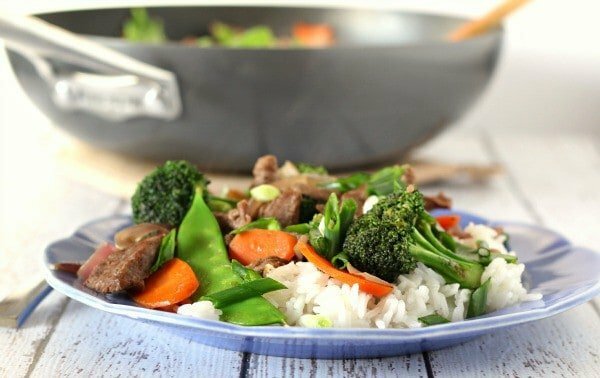 I love stir-fry so I would definitely try your recipe! It looks delicious! We love stir fry. We have a 10-year-old daughter whom we adopted from Hunan province in China, and we became great fans of stir fry for her. We eat stir fry about once every two weeks. A new wok would sure come in handy! I would make lots of pasta dishes. I would love to make up some chicken and noodles!! 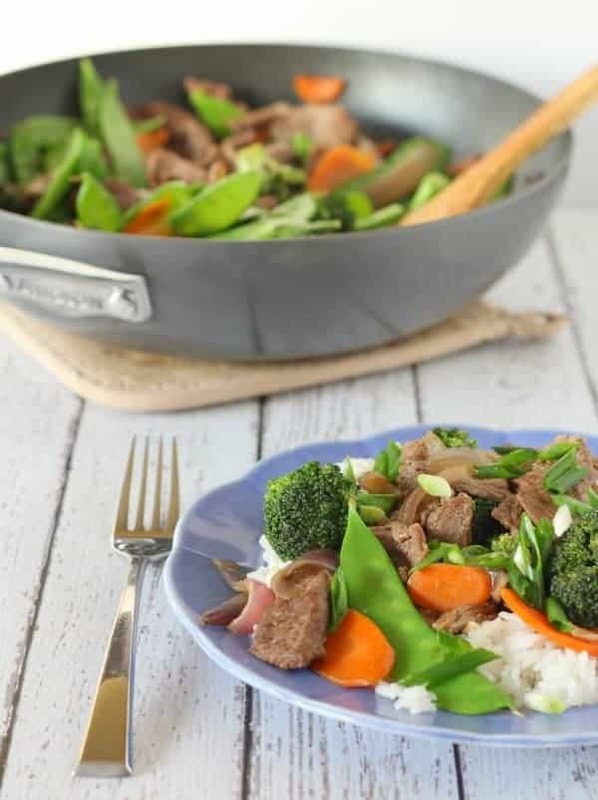 You made Stir fry look so delicious and easy, I think I would definitely try one with the Anolon pans. We just filled a freezer with on sale $.99 chicken breast, so we are set to go. Thanks for the chance at winning a set of gorgeous cookware. I’d make an Italian spread for the whole family! Pingback: Pan seared pork chops covered in a simple orange glaze. I would probably make a sno pea and asparagus stir fry, a weekly meal. Thanks for the chance! I would make spaghetti bolognese. I love stir frys,used to make them a lot and then stopped. Don’t know why, we loved them. I would make a chicken stir fry with lot of vegetables. Served over rice, it would hit the spot! Love these pans, they would help me so much in the kitchen. Mine are so old they look bad and the inside flaking!